Then, shock the pool with a Chlorine Shock or a Non-Chlorine Shock, at least 1lb per 10,000 gallons (follow package directions). Allow the chlorine level to return to 1.0 – 3.0 ppm before adding any winter algaecide and your pool cover. Chlorine tends to break down both algaecides and [floating] pool covers. Remove skimmer baskets, wall fittings, cleaners, solar blankets, ladders from the pool. Put these in a safe location during the winter. Don’t coil pool cleaners hoses tight. Lower water level in pool. Using the filter pump, or a submersible pump, lower the level 12″ – 18″ below the skimmer for mesh covers, and 3″ – 6″ below the tile for solid, floating covers. If you are using an Aquador skimmer cover on aboveground or inground pools for some vinyl lined pools, the water level will not need to be lowered. Drain all pumping, filtering, heating and chlorinating equipment. Every pump, filter, heater and chlorinator has drain plugs to allow water to drain out. All water must be drained or blown out or it will freeze and crack. After draining, D.E. filter grids or Cartridge filters should be removed and cleaned thoroughly. If the filter and pump is small enough to remove it and store it indoors, this may be desirable. If not, using a small amount of air from a shop vacuum, compressor or Mighty Vac is good to blow out any water that may still be in the equipment. Fall closing of the pool is a good time to lubricate the pump lid o-ring o-rings with Magic Lube. If you have a push-pull valve (also known as a slide valve) on the filter, lubricate it’s o-rings as well. If you have a gas heater with cast iron plugs, lubricate these threads or leave the plugs in after draining to prevent rusting. Skim pool, vacuum pool, brush pool. Leaf rake (bag) types skim nets are best. Also useful for scooping large amounts of leaves/debris from pool floor. If pool is especially silty or has lots of algae, Vacuum Pool to Waste. This means to bypass the filter, and vacuum dirt from floors/walls out the backwash line. This prevents constant clogging/cleaning of filter. Place the multiport filter valve on drain to waste position (usually 2pm, if viewed as a clock face) If you have a push-pull filter valve, or a cartridge type filter there is no easy way to vacuum to waste, except for cutting the pipe coming out of the pump and then reconnecting afterwards. Brush the pool thoroughly. The pool should be as clean and clear as possible before covering. If you have an inground pool, you should blow out the lines using a Mighty Vac to blow air from the skimmer, through the equipment, and back to the pool. Then plug the lines at the pool using expansion plugs. If you don’t blow the lines, add Swimming Pool Antifreeze into the line (follow package directions). Above ground pools usually just need to disconnect the hoses to and from the pump and filter, and plug the wall outlets. Add winterizing algaecide and other floaters. Remember not to add algaecide and shock at the same time. This tends to result in the chlorine breaking down the algaecide. High chlorine levels can also be harsh to floating solid pool covers. For winter chemical kits, click here. A tight fit of your pool cover is essential. 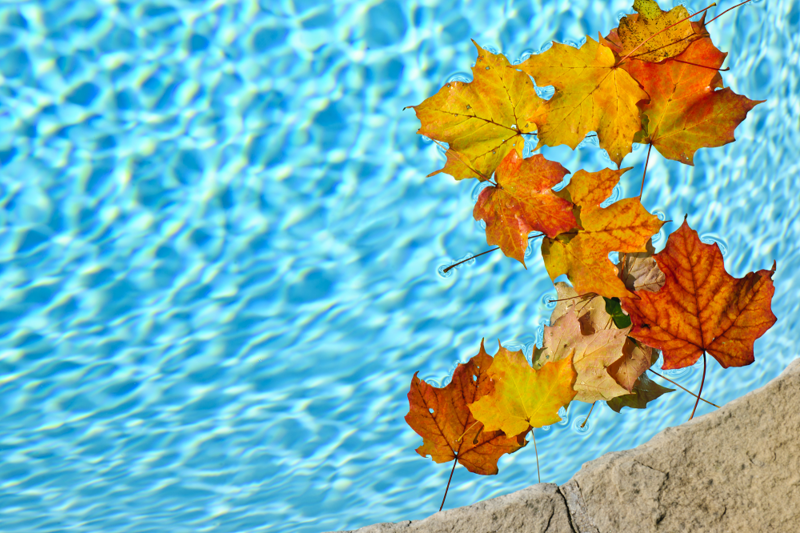 Your cover should not have holes or gaps where leaves and debris may enter the pool. A mesh safety cover provides the highest protection and safety. Solid pool covers are not safe and will require a cover pump or siphon to remove rain water and snow melt. Water Bags or AquaBloks are used to secure an inground solid pool cover. Above ground pool covers use a cable/winch device to secure the cover around the pool. Air Pillows are used in above ground pools to absorb the expansion of ice inside the pool. In areas of high wind, an above ground pool owner will find wall bags or cover seal useful products. A leaf net is very useful if you have a lot of trees surrounding your pool.